By choosing a refurbished Hewlett Packard DL180 G6 2U rack server from Bargain Hardware you will be buying one of the most economical and popular 2U servers ever produced, delivering the flexibility and performance for almost any business application. The DL180 G6 is capable of supporting up to 2 Intel Xeon Quad or Hex Core 5500/5600 series CPUs, with 6 DDR3 ECC Registered DIMM slots per processor giving a potential maximum RAM of 192GB. The industry standard 2U chassis supports up to 14 Hot Plug SAS/SATA 3.5" under the control of the HP Smart Array P410i RAID controller making this a fantastic Large Form Factor (LFF) FreeNAS Storage server or homelab. Redundant fans, hot swap power supplies and other components are present throughout the tool-free chassis, allowing for rapid maintenance and upgrades in mission critical environments. The specification is completed by HP’s comprehensive offering of I/O ports. Server management is through HP’s Lights-Out 100 (LO100) advanced suite. 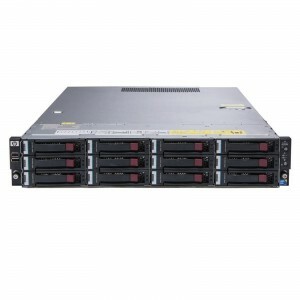 At Bargain Hardware we understand that complex business requirements vary from one customer to the next, that’s why we allow you to build your own refurbished HP DL180 G6 to meet your specific performance or budget preferences. Use our Configure-To-Order hardware options to select your desired configuration or alternatively select from one of our special pre-configured deals when available.